Heading off on holiday but worries about what will happen if you fall ill or lost your belongings? Travel insurance is a great way to put your mind at ease – and with a Flexicover discount code you can enjoy great rates on comprehensive cover. Whether it's a week away on the beach in Spain or a big backpacking adventure, a Flexicover promo code will save you money when you shop for insurance. Part of a company that's been trading since 1983, Flexicover is one of the UK's leading direct sell travel insurance providers. Established to provide holidaymakers and travellers with peace of mind when embarking on trips abroad, Flexicover has a wide range of policies for customers to choose from – helping you pick the right insurance for you, every time. With a dedication to customer service and making the often-complicated world of insurance clear and simple, Flexicover is a great choice for those who are unsure about what type of insurance they need. Going on a family holiday? Single trip insurance can cover you and your family for everything from accident and injury to lost luggage and cancellations – no matter where you're headed in the world. Planning the adventure of a lifetime? Flexicover's Backpacker insurance covers you for travel anywhere in the world – with the option to add on extras to cover activities like winter sports and scuba diving. Flexicover's policies have many features that help them to stand out from the competition. You can insure travellers up to 85 years old, enjoy free cover for over 120 sporting activities, get cruise insurance for no additional charge and even insure one way trips. They also offer long stay cover for up to 12 months for anyone under the age of 75, and 'Gap Year' cover for up to 18 months for anyone between 16 and 45. Travel with lots of expensive gadgets like cameras, laptops and smart phones? You can even get a special add-on that covers you for the loss or damage of these items – so you can stay connected while away without worrying about all your kit. Need help choosing the right policy for you? The company's friendly and helpful staff are on hand both online and on the phone to help you select the perfect policy for your trip. Want to get insured with Flexicover? With a Flexicover discount code you can enjoy fantastic savings on a wide range of policies for your holiday. Whether you're planning a city break, an island getaway or a multi-destination adventure, a Flexicover promotional code is a great way to get peace of mind for less. Insures travellers up to 85 years old. Browse our website until you find a Flexicover discount code that suits you, then navigate to their website to get a quote. Enter your Flexicover promotional code in the box provided and click 'Quick Quote'. Want to find out more about the policies available at Flexicover? Why not pay a visit to the company's dedicated YouTube channel? You'll find lots of exclusive content including special offers, industry news, global travel updates and more. You can also use this channel to find out more about saving money with a Flexicover promo code. If you've enjoyed shopping for travel insurance with Flexicover, why not get great deals on places to stay around the world with Booking.com or Hotels.com? Or, if those aren't up your street, you'll find plenty more stores to browse in our Travel section. Enter your Flexicover discount code in the box provided and click 'Quick Quote'. Fill in your personal and payment details to complete your order. Need to contact the team at Flexicover? Whether you have a question about travel insurance, want to know more about what is and what isn't covered or simply want to find out how you could make big savings with a Flexicover promotional code, you can contact the Customer Services department by telephoning 0800 093 9495. Want to find out what's happening behind the scenes at Flexicover? The company maintains a profile across all your favourite social media platforms. Follow them for lots of entertaining content such as competitions, special offers, travel tips and more. You can also use these pages to find out more about saving money with a Flexicover discount code. Don’t forget to check them regularly, as you can never be sure when a free Flexicover promo code might be waiting for you! Buy now online at www.flexicover.co.uk. When my nephew went on his first holiday alone, he worried he wouldn't be able to afford travel insurance. Luckily, I found a Flexicover discount code online. 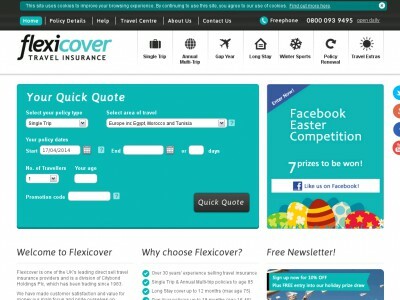 At flexicover.co.uk they offer a wide range of insurance options to suit all travellers – and with a Flexicover promo code it was great value for money. All we had to do was choose a policy and enter the Flexicover promotional code – and he was covered for a great price. So if you're worried about the cost of travel insurance, see what you could save with a Flexicover discount code.